We’d love your help. Let us know what’s wrong with this preview of Blades of the Fallen by Ross Harrison. The murderer changes everything. 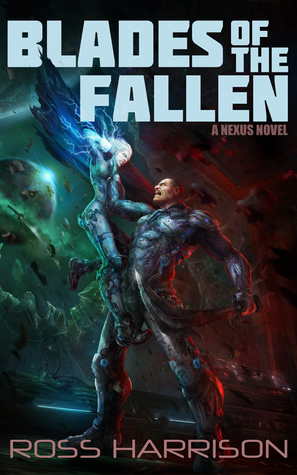 The Fallen keep to themselves, living comfortably separate to other Necurians. But he is dragging them towards war. Why is he so convinced that it’s the Va The murder changes everything. The Vanguard is supposed to protect against such violence, not fall victim to it. But even the so-called ‘Fallen’ wouldn’t kill without reason. Would they? To ask other readers questions about Blades of the Fallen, please sign up. Five stars should be fifteen,bloody brilliant book ,have gotta read more of Ross Harrison's work. An awesome, Mass Effect-esque adventure of galactic proportions. What seemed to be a simple assignment for two aspiring Vanguard turned into a haunting nightmare. Necurians are generally a peaceful race, but the upcoming conflict is going to test any and all of their convictions as they pursue a merciless killer across space. Let me just say: wow. This was excellent from start to finish. Such a beautiful, expansive, and detailed world was created amidst so few pages. There were only a few instance An awesome, Mass Effect-esque adventure of galactic proportions. Let me just say: wow. This was excellent from start to finish. Such a beautiful, expansive, and detailed world was created amidst so few pages. There were only a few instances of long, lengthy explanations of history or backstory. The rest was spread out and drip-fed as it became relavent to the plot so as not to overwhelm the reader. Great care was taken in the creation of the world and it really shows. Allegories for sexism and racism in the modern world were also heavy themes throughout. There were arguments done from both sides, and it was tasteful, meant to actually make the reader ponder about morality for a moment. The characters were wonderful as well. Significant differences were seen in their personalities at the end. Their development was thorough, emotional, and relevant to the kind of character they were. Psionic abilities were given to the Necurians, but they weren’t all-powerful. Appropriate nerfs were applied to their powers so that they still had challenges to overcome. The depth of the plot was astounding. There were a few different storylines intersecting throughout, all coming from different characters and different corners of the galaxy. Some were shorter than others, yet still necessary to either plot or character development. I didn’t have any questions left over at the end, nor was I left feeling unfulfilled at the resolution itself. Fight scenes are hard to pull off, and this novel excelled at them. This book is pretty plot based, focusing on the intrigue of the world and the action within. I really loved the fight scenes and in many ways this is like a futuristic military drama. SO if you want that, this is the book for you! That's not normally what I read, so I had to get into it a little. I would have wanted a bit more of a gripping hook in the beginning of the book to keep me reading, but it's an entertaining book that has a lot of promise for the future. Disclaimer: I received a copy o This book is pretty plot based, focusing on the intrigue of the world and the action within. I really loved the fight scenes and in many ways this is like a futuristic military drama. SO if you want that, this is the book for you! That's not normally what I read, so I had to get into it a little. I would have wanted a bit more of a gripping hook in the beginning of the book to keep me reading, but it's an entertaining book that has a lot of promise for the future. Ross Harrison is the author of novels and short stories in the realms of science fiction - specifically space opera and science fantasy - thriller, noir, and steampunk. He has been writing since childhood, and occasionally likes to revisit those old stories for a good cringe and nervous laugh. He also talks about himself in the 3rd person because it seems more professional. Ross lives on the UK/Eir Ross Harrison is the author of novels and short stories in the realms of science fiction - specifically space opera and science fantasy - thriller, noir, and steampunk. He has been writing since childhood, and occasionally likes to revisit those old stories for a good cringe and nervous laugh. He also talks about himself in the 3rd person because it seems more professional.